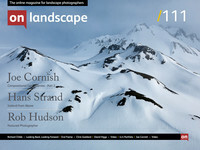 I was a little surprised to realise that although Rob Hudson has written a few pieces for On Landscape, he hadn’t been interviewed. I thought it was time to correct that – those who know him will know that he has plenty to say! One of the things I enjoy most is learning more about the different ways in which we relate to the landscape, and how this is reflected in our image making. Rob’s work demonstrates the importance of series, which gives a photographer space to develop and to communicate. If you are looking for a straight record or a conventionally pretty view, then Rob isn’t your man. However if you want to get past received wisdom and think more about your relationship with the land, then read on. Would you like to start by telling readers a little about your background, and your formative influences?